It's a great opportunity to bust through some of those scraps that I know you all have lying around (wink, wink). PLUS, you get the chance to win some fabulous prizes!!! 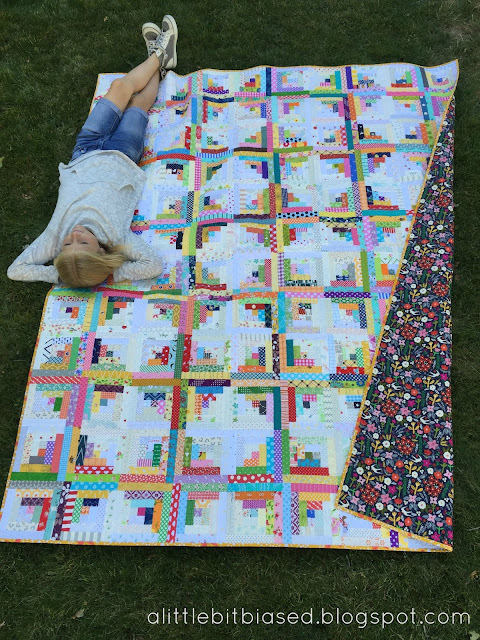 Simply upload a photo of a scrappy quilt (that you finished this year) to the Scrap Quilt Challenge 5 Flickr Page by midnight on October 15th (that's just two more weeks, friends!) and you could win BIG!!! Click HERE for more details! I wanted to share with you my recently finished Scrappy Log Cabin Quilt! #3 Paper piecing ensures perfectly straight, square blocks! Finished block size = 7"
Finished quilt size = 70" x 84"
Machine quilted by Cathy Barney in Alpine, UT. Would you like this block pattern? to help you get started! Click HERE. Now go on and get scrap busting! Total #CreativeGoodness. Absolutely inspirational quilt. Timeless. Beautiful ........... thanks for the block pattern ! Sooo BEAUTIFUL!!!!! Thanks for the pattern also....it is on my growing to-do list, haha!